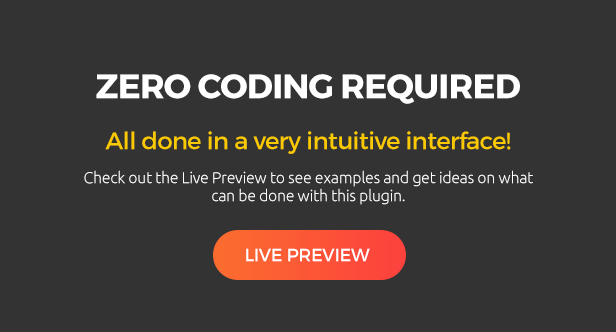 The plugin comes with 18 ready to use templates that you can check on the live preview demo site. 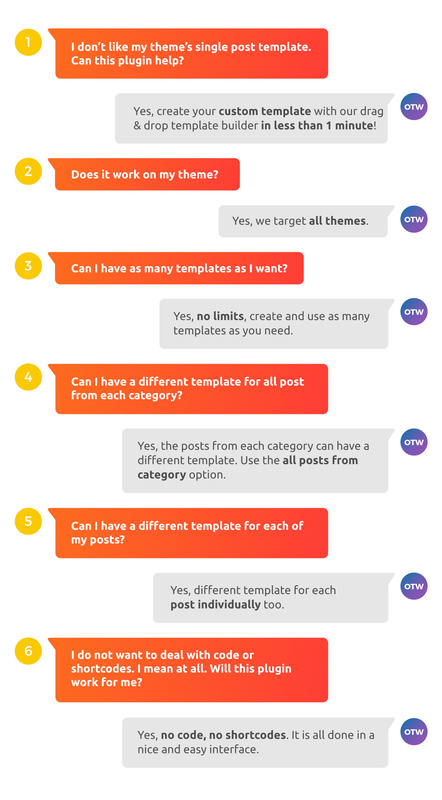 If you want to create a beautiful custom template for your single posts this is the perfect tool for that. No need to deal with code, files, expensive developers any more. Save time and money do it yourself under 1 minute! Create the layout – all layouts are responsive by default. Insert post attributes in the layout- title, media, description, meta, comments, next/previous navigation, tabs, social icons, related posts, reviews, author info, facebook comments, breadcrumbs, ads, sidebars, etc. 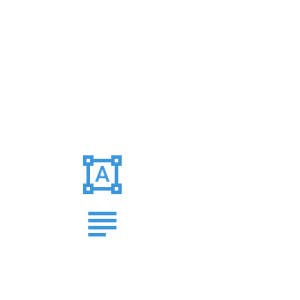 Re-arrange the layout or the post attributes – drag & drop. Each grid row has settings that include full width background color, animation, image, pattern, video. Parallax effects, Background filers and gradients. Full width content and full row height too. To see some examples, check on the demo site of the plugin. Again, there is no need to deal with code or files. Post meta items – categories, tags, author, date, comments, post visits can be re-arranged. And whatever is that you do not want to see can be disabled. All drag & drop. Other than the standard horizontal view, post meta elements can be displayed vertically. You can also choose to display icons instead of the labels. Styling and alignment are also available. You can use the default WordPress featured image functionality for your posts. But what if you want to have a video, a slider, or a soundcloud instead of the standard image? Then use the OTW Media types – Image, Slider, Youtube video, Vimeo video, Soundcloud. The media then gets displayed in your posts. In the plugin options you can set the media width, height, formats. You can also automatically add alt and title tags to improve SEO performance for your images. Yes, you can enable lighboxes. A click on the media will then open the media in a lightbox. In the plugin options you can set the media width, height, formats for the lightboxes. Yes, you can now have tabs in your posts. Add unlimited number of tabs with title and content. Add some HTML and shortcodes in the content if you need to. Yes, you can now have reviews in your posts. Add unlimited number of reviews. Increase traffic! Enable Social share options. You can choose from variety of like and share buttons or put your custom once. Increase traffic! Enable Facebook Comments in your Posts. Set up is easy and takes no time. Yes, this plugin will add the Facebook comments functionality to your single posts. Display related posts under each post so you can increase traffic to other posts too. Select Related post criteria: by Category, by Tag or Handpicked. Handpicked is an option that will let you choose related posts for each posts manually. Post Fields can be used to add some additional info to your posts. Add unlimited number of Post Fields. You are not only purchasing a great piece of code full of features. You also purchase regular updates, constant improvements, detailed documentation, training videos and a whole support team that is here for you. This plugin works on any WordPress theme. Includes detailed documentation and training videos. 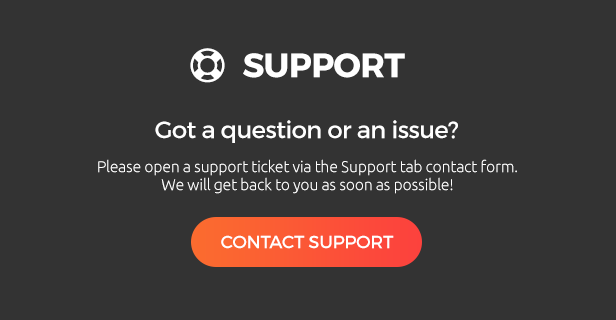 If you need any help please do not hesitate to open a support ticket. We are here to help. We keep everything up to date and add improvements constantly. Missing a feature? – let us know. Include this item in your themes. All you need is 1 extended license for each theme you put on the market and permission from the author which you get by writing us. Great plugin with tons of features but even better – Amazing Customer Support. The best I have seen for any plugin. This will make you become a repeat customer ! Awesome, awesome support. Goes the extra distance to support their plugin if asked. Would recommend them to anyone and will use them for future client sites. Support means everything. Good that you have a great support. Simple, lightweight, flexible. Excellent customer support. Excellent plugin, exactly what I was look for, very flexible and helpful, quick response to support query. Would definitely buy again. Thank you! 6 Months SupportWhat does it include?